This week in our series, Kay Gallant and Harry Monroe continue our story of the Civil War with the Battle of Vicksburg. 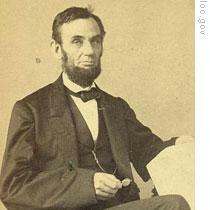 In November eighteen sixty-three, President Lincoln traveled to Gettysburg, Pennsylvania. He spoke at the opening of a military cemetery. He felt very tired by the time he got back to Washington. Doctors thought he had a cold. Later, they said he had a weak form of smallpox. The president remained in bed. Few visitors could see him. There was a danger the smallpox could spread. Lincoln got better after a few weeks. He began working on his yearly message to Congress. After two-and-a-half years of war, he had good news to report. Union armies had gained two important victories at about the same time. One was the battle of Gettysburg. Union forces led by General George Meade had defeated Confederate forces led by General Robert E. Lee. They pushed Lee back into Virginia. It was the last Confederate invasion of the North. 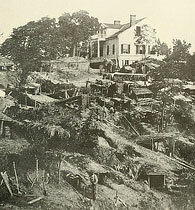 The day after the battle of Gettysburg, Union forces defeated Confederate forces at Vicksburg, Mississippi. This victory gave them control of the Mississippi River. And it split the states of the Confederacy. 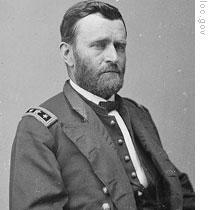 Union General Ulysses Grant had been trying to seize Vicksburg for several months. It was not easy. Vicksburg lay on the east side of the Mississippi River. It was built high above the water on a rocky cliff. As the river flowed past Vicksburg, it turned in sharply at the base of the cliff and then continued on to the Gulf of Mexico. The Confederates had placed cannon all along the sharp turn in the river. Enemy boats sailing past, made easy targets. General Grant began the campaign for Vicksburg in late eighteen sixty-two. His army was west of the Mississippi River. He needed to get to the other side to attack the city. First, Grant planned to cross the river into northern Mississippi state. Then he would march south to Vicksburg. He crossed the river. But Confederate forces destroyed his transportation and supply lines. He withdrew. Early in eighteen sixty-three, he tried again. This time, he planned to sail his men past Vicksburg. They would cross the river a little downstream, turn and attack. Grant moved forty thousand men to a point ten kilometers from Vicksburg. He told the men to put down their guns and take up digging tools. They would build a canal to carry them past the turn in the river, past the Confederate cannon. For weeks, the Union soldiers worked on the canal. They dug through mud and wet clay. Many died of disease. After more than a month of digging, engineers decided that the canal would not work. Grant ordered the men to build another canal. Then another. They did not work, either. By this time, the Union soldiers had become experts at digging canals. One of them said: "As soon as the canals at Vicksburg are finished, we are going to cut a canal across the upper part of Florida. We will cut that state off from the Confederacy, and give it to the alligators!" Finally, in April, eighteen sixty-three, Grant gave up all ideas of getting past Vicksburg without a fight. He decided to march most of his men down the west side of the river to a steamboat landing thirty kilometers below Vicksburg. He would send his navy boats past the city at night and hope for the best. It took three weeks for Grant's men to reach the steamboat landing. The roads were very rough. In many places, they were covered with water. Engineers had to cut trees and cover the muddy roads with logs so wagons would not sink. They had to build bridges over the many streams. On the night of April sixteenth, the Union navy made its run past Vicksburg. Eight gunboats and three empty troop boats floated down the dark river. Their engines were silent. The Confederates, however, had built fires along the river. They saw the Union boats and began to shoot. They hit most of the boats, but destroyed only one. The damaged boats reached safety below the city. On the last day of April, the Union troop boats began carrying soldiers to the east side of the river. About twenty-three thousand men crossed. Right away, they faced a force of eight thousand Confederate soldiers. They drove the Confederates back. Grant then ordered the rest of his army to cross to the east side of the river. Some of his officers protested. They said it would be impossible to get supplies to a large army east of the river. Grant was not worried about supplies. He said the men should bring only coffee, hard bread, and salt. Anything else could be taken from the farmers of Mississippi. Their homes, he said, were full of food. Grant decided not to throw his men against the strong defenses around Vicksburg immediately. Instead, he marched them east toward Jackson, the state capital. Jackson was the supply base for the Confederate army defending Vicksburg. Grant wanted to cut the supply lines between the two cities. He also wanted to prevent the soldiers in Jackson from joining the soldiers in Vicksburg. Grant captured Jackson easily. He left some troops to destroy enemy supplies. He took the remaining troops and turned back toward Vicksburg. Grant attacked Vicksburg several times. Each time, his troops were thrown back. The city's defenses were too strong. Grant then decided to surround the city and wait until its food was gone. That, he thought, would make the Confederates surrender. Grant closed in with men and artillery. As one soldier wrote: "The circle of Union forces around the city was so tight that a cat could not have crept out without being discovered." Nothing could get out. Nothing could get in. Weeks passed. The Union army shelled the city. The Confederate army answered from time to time. Food supplies dropped. There was little to eat except corn bread and the meat of mules. Some people caught rats and ate them. Finally, the Confederate commander, General John Pemberton, decided the situation was hopeless. He sent word to Grant that he was ready to discuss surrender. The two commanders met under a white flag of truce. Grant demanded unconditional surrender. Pemberton rejected the demand. Pemberton's men were to be prisoners. That was a fact. But Pemberton wanted them released immediately on parole. He told Grant that his men would promise to stay out of the war if permitted to return to their homes. If not, he said, they would continue to fight. Grant agreed to let the Confederate soldiers go home. He and Pemberton signed the surrender agreement on July fourth. 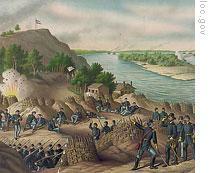 The siege of Vicksburg had lasted forty-seven days. Never had a Union army won such a victory. Grant had taken thirty thousand Confederate soldiers out of the war. He had captured sixty thousand guns and one hundred seventy cannons. These were serious losses for the Confederacy. It already was low on manpower and weapons. But an even greater loss was the control of the Mississippi River. With Vicksburg in Union hands, the North could control the whole length of the river. And the confederacy was split badly. Our program was written by Frank Beardsley. The narrators were Kay Gallant and Harry Monroe. You can find transcripts, MP3s and podcasts of our programs, along with historical images, at www.unsv.com. And you can follow us on Twitter at VOA Learning English. Join us again next week for THE MAKING OF A NATION -- an American history series in VOA Special English.